Nursing homes are designed for restorative care such as rehabilitation and stabilization, whereas a hospice team brings expertise and skill in the kinds of symptom management, family communication, psychological, and education needs that often arise for patients and families at the end of life. When people think about hospice care, they usually think of services being delivered in a patient's home or a freestanding hospice facility. Many are surprised to learn that the Hospice Medicare Benefit, a primary payer of hospice services, allows for hospice care in assisted living facilities (ALFs) and skilled nursing facilities (SNFs), the latter of which are commonly referred to as nursing homes. Whether in the home or a residential facility, the scope of hospice care and underlying philosophy are the same: to provide interdisciplinary care for patients with a terminal illness and prognosis of six months or less, focusing on symptom management, comfort, and enhanced psychological and spiritual support. Typically, hospice patients have chosen to avoid hospitalization unless there is an acute symptom management need that cannot be otherwise resolved and to forego unwanted diagnostic testing and aggressive treatments intended to extend life such as intravenous hydration and mechanical ventilation. A hospice team comprises professionals such as an attending physician, registered nurse, social worker, chaplain, certified nursing assistant, and those in any other discipline specifically identified in the patient's care plan (such as a bereavement counselor). In many cases, a hospice volunteer provides additional social and practical support. Although nursing homes have registered nurses, certified nursing assistants, and, typically, a social worker, a hospice team brings expertise and skill in the kinds of symptom management, family communication, psychological, and education needs that often arise for patients and families at the end of life. "The reason we need hospice in nursing homes," says John Cagle, PhD, MSW, an associate professor in the School of Social Work at the University of Maryland, "is because nearly a quarter of deaths in the United States occur in the nursing home and hospices provide high-quality end-of-life care whereas nursing homes are designed for restorative care such as rehabilitation and stabilization." In an article for the Journal of Pain and Symptom Management, Cagle (2017) and colleagues interviewed frontline employees working in nursing homes and found that "staff comments were generally positive about involving hospice in the care of dying patients. Participants reported, for example, that hospice provides a welcomed layer of extra support, needed expertise in pain and symptom management, and helpful bereavement care for families." Critical to this extra support is the hospice social worker. 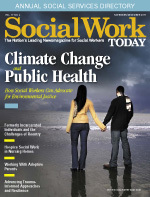 Although federal law mandates that all nursing homes provide "medically related social services to attain or maintain the highest practicable resident physical, mental, and psychosocial well-being," according to the Social Work Policy Institute only about 62% of nursing home social workers have degrees in social work. This is because the law allows the role to be filled by someone with a BSW, MSW, or any "similar professional qualification." This means that many have backgrounds in areas such as psychology, sociology, counseling, or gerontology. Whatever their backgrounds, most facility social workers have little time to spend with any one resident, much less give a resident and family the extra attention needed for optimal end-of-life support. Caseloads are high, regulations require time-consuming documentation, and many nursing home social workers have additional responsibilities related to tasks such as admissions, marketing, discharge planning, and participating in regular meetings. Few have substantial training in end-of-life intervention, and most do not have the experience or credentials for providing the kind of psychological counseling available from a hospice social worker. As Caitlin Connolly, MSW, LICSW, says, hospice social workers bring expertise and knowledge that, when "combined with those of a nursing home social worker, can only enhance the level of support to both the patient and family as well as improve the overall level of care." Connolly, a social worker with Hospice of the Northwest, says, "the value of having a hospice social worker in addition to an SNF social worker is the expertise we hold with regard to end-of-life care and facilitating delicate, often difficult conversations. Additionally, the awareness we hold of resources available to patients and families in the community, both while on service and after a patient dies, relieves feelings of abandonment or isolation that families may carry after a loved one dies." Ethan Lechner, MSW, PhD, a social worker at Carol Woods Retirement Community, agrees that it's helpful to have a social worker who specializes in end-of-life care. "Carol Woods social workers support residents in a lot of complex situations, and end of life is just a fraction. So naturally we are not as deeply familiar with effective ways to talk to dying people as a hospice social worker," he says. Though hospice patients in nursing homes face many of the same challenges as those living in their homes, some challenges may be more common in nursing home settings. However caring the staff may be, institutional environments can feel impersonal, even dehumanizing. Residents and families are often forced to conform to set routines and adapt to limited space with little room for keepsakes and other personal belongings. Given multiple demands on staff and often high staff-to-resident ratios, residents often must wait longer than they or their families would like for assistance, which can become a source of stress and friction. Lechner says that "our facility strives for as much staff consistency as possible" but points out that because nursing homes provide around-the-clock care, residents will be served by rotating staff with varying levels of familiarity and personal connection. This rotation, he says, can cause "communication glitches" and lead to occasional misunderstandings about a patient's preferences and needs. Sue Smith, MSW, LCSW, supervisor of the facilities care team at Hospice and Palliative Care Center of Alamance-Caswell, notes that in such environments privacy is often compromised or nonexistent. "This can make things difficult for families and patients who are looking for a safe space to share or process what they are feeling as well as for roommates who may be anxious about death and who may be experiencing their own grief," she says. Smith notes that in such cases, in addition to counseling and exploring coping strategies, a hospice social worker might explore creative ways to enhance privacy such as advocating for the patient to have a private room. A relatively high percentage of nursing home residents has significant cognitive impairment, including dementia. When a hospice patient has altered cognition it can cause behavioral issues, impede communication, and undermine opportunities for interpersonal sharing and life review. It can also leave loved ones to make difficult decisions without input from the patient. When nearby residents have dementia, Lechner says, "their behaviors might seem peculiar or even invasive" to dying patients or their families. In these situations, a hospice social worker might help a family explore alternative ways of communicating and expressing connection. They might facilitate life review within the family and provide supportive counseling and education about dementia. They may also teach strategies for navigating stressful behaviors or suggest environmental modifications likely to soothe a confused patient or roommate. Many families with loved ones in facilities have been unable to care for them at home due to practical demands, medical complexities, financial realities, or limitations in time and/or the physical stamina to be caregivers. Some live out of town or have competing responsibilities or personal challenges that limit their ability to visit as often as they would like. These and other factors can contribute to patients feeling isolated and/or depressed and can cause frustrations, stress, and feelings such as anger, guilt, and shame in loved ones. Smith says hospice social workers often become links for families living at a distance by "relaying information, giving updates, understanding the situation a family is in, and reassuring them that their loved one is comfortable and cared for." She notes that being in touch with these families better enables hospice social workers to serve as a resource for nursing home staff "to ensure that the person's wishes are being maintained in the absence of family, to connect patients with spiritual interventions as needed, and to continue to work with facility staff to promote a patient's dignity and self-worth." Other challenges may stem from the fact that SNFs' regulations, policies, protocols, and cultural norms are typically geared toward rehabilitation and maintaining current levels of resident functioning. Cagle points out that "the metrics used by skilled nursing facilities that assess the quality of care may not be congruent with end-of-life care." For example, reduced fluid intake and dehydration are expected parts of the dying process but may be viewed negatively by facility staff who may want a family to consider IV fluids. A hospice team would view these symptoms within the context of terminal illness, patient wishes, and the limited benefits that might result vs. the potential harm that such an intervention might cause if a patient's body is sufficiently debilitated that IV fluids cannot be properly absorbed. According to Judi Lund Person, MPH, CHC, vice president of regulatory and compliance for the National Hospice and Palliative Care Organization, "If hospice staff is unaware or not sensitive to the pressures the nursing home is under with the current nursing home regulations and interpretive guidelines, the tensions will be high." Connolly recalls a patient with Alzheimer's disease whose family was concerned that nursing home staff was being aggressive in pushing the patient to eat. From the facility's point of view, it was an ethical obligation to do so, but for the family these efforts were extending the patient's life at a time when quality was negligible, placing her at risk of choking or aspiration. They pointed out that the patient's "advanced care directives clearly stated that she granted her health care power of attorney the ability to discontinue manual feeding." According to Connolly, the hospice team crafted a solution in which the patient was offered nutritional supplements that were acceptable to the family, thereby reducing the risk of choking and eliminating the sense of moral anxiety some nursing home staff were feeling about discontinuing nutritional intake. The patient's comfort and safety were thus enhanced, tension between the family and nursing home staff eased, and the patient was able to die peacefully with "the family having given their blessing and the staff having felt more peace with the decision and approach." According to a study, despite the fact that the number of nursing home residents receiving hospice has been growing, approximately 66% of decedents in nursing homes do not receive hospice services. Some may have chosen a more aggressive approach to care and others may have died suddenly from an acute event, but, unfortunately, many barriers still exist when it comes to optimizing patient choice about hospice care. One barrier is that in SNFs, unlike ALFs, in order for a resident to be offered hospice services, a facility must have a contract with a hospice to provide those services and currently there is no mandate that they do so. According to the Center for Medicare Advocacy, some nursing homes are reluctant to contract for hospice service because administrators "believe that the staff at the nursing home has the needed expertise to provide end-of-life care" or that "the hospice philosophy of care, that is, a focus on caring rather than cure, violates nursing home regulations." Cagle says one of the major barriers to eligible residents receiving hospice care is financial disincentives that may influence patients and facilities to favor a rehabilitative approach. "Under the existing Medicare rules, patients cannot concurrently receive both 'skilled care' (meaning rehabilitative care such as physical or occupational therapy) and hospice" so they may have to choose one over the other. Given the fact that "the Medicare benefit for 'skilled' care also pays for the nursing home room and board for a certain number of days, while the Hospice Medicare Benefit does not," patients who qualify for either benefit and who choose hospice care may face additional bills that can run into thousands of dollars a month. "Having a patient choose the skilled benefit generates more revenue for the nursing home," Smith says, "and facilities depend on this additional revenue to help balance out the cost of residents who have Medicaid as their payer source (which has a lower reimbursement)." She adds that some SNFs work with "managed care groups that feel they can provide hospicelike care through a nurse practitioner, but this misses the main advantages of hospice, which are to have a skilled interdisciplinary team and 24-hour-a-day on-call availability as well as follow-up services for loved ones like bereavement counseling." Cagle says social workers, whether facility or hospice, can be a strong voice of "advocacy for policies to fix the financial disincentives that create barriers to hospice care." Other barriers include the fact that having conversations about hospice care and end of life is difficult, and SNF staff may not be trained or comfortable in initiating such conversations or they might not have the time. Staff may not be familiar with the diagnostic and prognostic criteria with which to identify potential hospice patients. Some may have negative perceptions that hospice means giving up or withholding care, or that hospices may try to "take over" care of residents and marginalize the existing SNF team. Given these barriers, Smith, who supervises a hospice team that specializes in serving ALF and SNF residents as well facility staff, believes it is essential that hospices work hard to build relationships and trust with area nursing homes. "Understanding the dynamics in a facility, appreciating their struggles in providing care in that system, having a knowledge of a facility's culture, and becoming an integral part in the facility shows that we care about them, we appreciate what they bring to the job, and we are not trying to take over the care of folks that have been in their care and for whom they may have great affection," she says. Smith adds that when such trust and teamwork have been established, "the facility is more open to suggestions, to education about end-of-life care, and to referring people who can benefit from our services." Presently there are 1.5 million people residing in nursing homes. With regulatory pressures to improve pain and symptom management outcomes, and looming Medicare penalties for facilities with high rates of rehospitalization, the prospect of strong partnerships between hospices and SNFs, as well as between hospice and nursing home social workers, is bright. Teamwork between hospice and SNF is essential, Lund Person says, since "regulatory scrutiny for hospices providing care in nursing homes will especially focus on the coordination, communication, and collaboration between the hospice and nursing home in care planning, where there should be evidence of collaborative care planning in both the hospice's medical record and the nursing home's medical record." Cagle sees social workers in facilities and hospices as natural allies given the profession's central values of person-centered care, client/patient advocacy, and respect for the right of individuals to be involved in care planning and to make their own decisions. "Social workers can advocate for a resident-centered approach, team support, and ensuring that hospice is made available to residents who are dying," he says. Cagle, J. G., Unroe, K. T., Bunting, M., Bernard, B. L., & Miller, S. C. (2017). Caring for dying patients in the nursing home: Voices from frontline nursing home staff. Journal of Pain and Symptom Management, 53(2), 198-207.